And how does that literally translate? To me are pleasing crepes. She to me is pleasing. Alright, so…What was that new phrase we started this podcast with? I like milk chocolate, but Я люблю dark chocolate! And I like spaghetti, but Я люблю пиццу! Say: I love to dance! икру…with an “uu” sound because we’ve done something to the caviar. We wanted it. Why is it ending with an “ah” sound? Икра. Doesn’t liking it count as doing something to the caviar? And thus, shouldn’t it change to икру? Hit pause and give your own explanation for this. If you understand this point, you’ll have another major aspect of Russian grammar mastered. …and that’s why it’s now икру with an “uu” ending. Let’s practice this idea of liking vs. loving. In that first one we had Водка with an “ah” and in the second one we had водку with an “uu”. Why? Because vodka is doing the action in the first sentence. But in the second one, we’re doing the action – we’re loving vodka. Apologies, by the way, if I’m beating a dead horse with this grammar point, but again, if you get this, you’re actually mastering a big chunk of Russian grammar. Fill in the blank with one of those cities. Ready? Did you remember to change the “ah” at the end of Москва to an “uu” sound? Москву. I’d love to stay for dinner HO it’s getting late…I really should go. I’d lend you the money HO I left my wallet at the office. I like Moscow but I love St. Petersburg. Мне нравится Москва но я люблю Санкт Петербург. I love pizza, but I don’t want to eat. Я люблю пиццу но я не хочу кушать. One of my listeners wrote the other day and asked, “I listen to your podcasts every day and I think I’m doing really well. But I worry that maybe my pronunciation isn’t very good. And the problem is I have no one to practice with in my area. Any suggestions? Spasibo!” From Janet, in Vermont. Thanks for writing, Janet. And that’s certainly a common issue. So what I’d like to offer you Janet, and any of our listeners who are in the same boat, is a chance to use our Success Coaching over at Russian Accelerator. For free. I wish I could offer the full, year-long access that Russian Accelerator members get, but I can’t do that. Still, I invite you to send them one recording of yourself. So here’s what to do. And again, this invite is for anyone listening to these RussianMadeEasy podcasts. In a day or two, one of our coaches will have listened to it, and will get back to you with their comments. Because, really, one of the most important things for you, as a new student is to know that a native speaker understands you. Translates as I love you. Either is fine but that second one is probably more common. I like Kiev but I love Odessa. I love St. Petersburg and Moscow. Я люблю Санкт Петербург и Москву. I like blues but I love rock. Мне нравится блюз но я люблю рок. 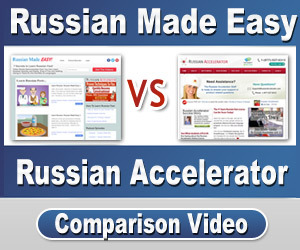 Alright…As always, head over to RussianMadeEasy.com for today’s audios and transcript. And you’ll find our Success Coaching email address there, too, if you didn’t write it down. In the next podcast we’ll talk about heading out and seeing the town. Keep practicing, and I’ll see you next time! I have a question; the word “you” is translated in Russian as Ты, when it is subject and Bac when object (Как Вас зовут?) . In today lesson 12 I’ve learned this new Tебя (Я Tебя люблю). There are two ways to say you in Russian as object? So before choosing which form, you need to know who you’re addressing. Podcasts 11 and 12 teach us the Russian for “like”, “do not like” and “love, but how would you say “I hate caviar”, or “I hate vodka” ?? The Russian verb “to hate” ( ненавидеть ) is not as common in Russian as in English. Literally: To me VERY not pleasing caviar. Мне очень не нравится икра. Interesting use of the adverb “очень” rather than using a stronger word as we would in English. Hi, I heard a song in the end of the previous episode(11), can you please tell me where I can get that? I think it is part of our learning process. You would have included it other wise. Thank you, Mr Mark. Great podcast! Why do we say Я тебя люблю and not Я тебy люблю (or however that ought to be spelled for the “oo” “being acted upon” sound)? Thank you. I’ve really been enjoying these lessons! I have a very specific cultural question related to the use of the word “lublu” (love). I have a Russian friend who I sometimes practice my Russian on – (gotta feel for her!!!) – and when I commented to her little girl “Ya tibya lublu,” Milena advised me that Russians don’t use the word for love nearly as liberally as we do here in America. She said that it is a phrase chiefly reserved for romantic relationships. Thus, it would be a little odd for a family friend to make that particular comment to one’s child. Is this true? (and having three native speaking kids of my own, now) I feel comfortable weighing in. I hear ‘lublu’ used all the time for non-romantic relationships. But I also hear it from non-family members. My wife has friends who love our kids. But it’s not said casually, I suppose. They really do love them. Again, though merely family friends, it’s being unsed in the ‘familial’ sense. THAT for sure you’d only use to your partner. Really enjoying the lessons. Also learning the alphabet, which is fun too. Have lots of Russians moving to Australia so there are plenty of friends to practice on.